Some 60 brethren together with guests of Anfield Lodge No 2215 met at the Geoffrey Hirst Masonic Suite at Woolton Golf Club, to witness an unusual initiation ceremony. Pictured from left to right, are: Sam Robinson, Kevin Poynton and Andrew Whittle. The WM Andrew Whittle, Chairman of the Woolton Group, opened the lodge by welcoming all present, saying that what seemed a good idea a few months ago may be somewhat different. The usual business was attended to quickly so that the ceremony could begin, but first the WM requested that the following brethren honour the lodge and assist him. Assistant Provincial Grand Master Kevin Poynton to occupy the senior warden’s chair, Woolton Group Vice Chairman Mike Cunliffe to occupy the junior warden’s chair, Assistant to the Provincial Grand Principals Sam Robinson to act as junior deacon, group charity steward Gary Devlin to act as senior deacon and group treasurer David Dutton to act as inner guard. 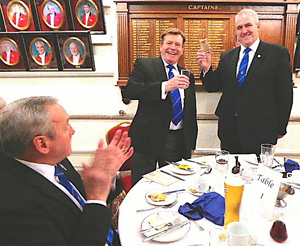 So, the scene was set, with senior members of the Province taking major roles within the lodge. All attendees waited patiently to see what would happen – would there be a lot of prompting? Not a bit of it – like all good stories it had a happy ending. The initiate, who has asked not be named, duly entered the lodge and was asked the usual questions which he answered with candour. He proceeded to take his obligation and was conducted around the lodge by Sam Robinson and Gary Devlin. This was a night that the initiate would forever remember, when eventually understanding the significance of those in office. Having taken his obligation, the newly made brother was conducted to the junior warden Mike Cunliffe, for a flawless explanation of the working tools of an entered apprentice Freemason. This was followed by Kevin Poynton delivering the ancient charge founded on the excellences of the institution and the qualification of its members. Diners eagerly await their meal. The newly made brother was now at liberty to retire in order to restore himself to his personal comforts. On his return to the lodge the WM provided an explanation of the gloves, following which a pair were presented to him, together with a festival tie and a set of Anfield Lodge celebratory cufflinks, which had been struck to mark the lodge’s centenary. Other lodge business was conducted, with Stephen Lyon putting forward a proposition for a new member, which was seconded by Phil Lyon. The WM sincerely thanked the acting officers, which was met with acclaim from those present. After the third rising, the lodge was duly closed and the brethren retired to the dining room for chef’s spring rolls, chicken curry and fruit salad with ice cream. During the dinner Steve Lyon organised a raffle, raising the magnificent sum of £270, which would be put into Anfield Lodge’s charity account for disbursement at some future date. The evening drew to a close with the final toast given by the tyler.